Chinese crafts and folk arts date back several centuries. The Chinese culture has a deep reverence for art and beauty. Early Chinese art used themes based on the natural environment and enjoyment of the landscape. Many of the traditional Chinese crafts and folk arts incorporate these themes. Chinese arts and crafts emphasise simplicity and are meant to convey harmony between society and nature. Many of the art pieces show isolated landscapes schemes, such as beautiful mountains or trees. There are a variety of celebrated Chinese crafts. These crafts incorporate many different mediums – wood, silk, bamboo, clay, jade and paper. Chinese crafts are an incredibly diverse group of arts: painting, sculptures, paper cutting, etc. We’ll briefly look at several of the crafts that are characteristic of the Chinese folk art and Chinese craft ideas. Let’s look at some of the many beautiful Chinese crafts and Chinese folk arts by the medium that’s used in their production. China is a country rich with natural resources, including a rich, dark clay that has been used for centuries to produce Chinese clay sculptures. Chinese sculptors were master craftsman. There is evidence of their great skill which dates back to the Han Empire (202 BC – 220 AD). In later centuries, Chinese sculptors incorporated bronze into their sculpting. In March of 1974 an underground chamber was excavated in China; the contents of the tomb revealed literally thousands of magnificent Chinese clay sculptures, including 6,000 life-size terra-cotta soldiers and 1,400 ceramic Chinese figurines of cavalry men and chariots ready for battle. During the following centuries and dynasties, Chinese sculptures incorporated a firing and glazing process to their clay works, creating beautiful, elaborate ceramics. Chinese arts are known for beautiful Chinese figurines, ceramic vases and plates. In fact, China perfected the hand-painting and glazing of ceramics, skills that were later borrowed by many companies in the production of fine china. Chinese arts have long incorporated the use of stone, jade, ivory and other semiprecious stones. Chinese jade has long been a highly prized form of carving, both used in jewellery and sculptures. 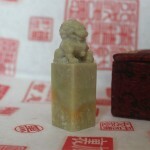 Jade has been used in carving of Chinese snuff boxes and other containers. Chinese Snuff Boxes were common items in many households in China for centuries. Because of the humid climate of China, actual snuff boxes were impractical. Instead, people used medicine bottles with small corks and an attached spoon to hold snuff and keep it dry. Chinese snuff bottles were made of metal, jade, ceramics and glassware. Glass bottles were intricately painted on the inside of the bottle. Other snuff boxes were painted or decorated with cloisonné on the outside of the box, making them items that could be cherished for centuries. Chinese Cloisonné is an intricate enamel process that produces beautiful jewellery, vases and other decorative objects. The cloisonné process is multi-steps. First, metal is shaped into the desired shape of the final object. Then, a design pattern is sketched onto the object (this is one of the practical uses for Chinese papercuts). The design is sectioned onto the object using solder. Glass frit fills in the sectioned off areas, then the piece is fired, resulting in a beautiful, intricate art object. No discussion about Chinese craft ideas would be complete without a discussion of Chinese swords. Few people realize that China was the country to first master the art of sword making and the steel production. Chinese swords are known for their strength and finely honed edges, as well as their beautiful inlaid and semi-precious stone hilts. Paper was invented in China, so it’s only natural that paper was a much used medium for Chinese craft ideas. Chinese paper cutting is a traditional craft of China, and in fact was once the main art form of China. Most of the paper cutting artists were (and are) women. Papercuts are made with razor sharp knives and later, scissors. Chinese papercuts are almost like sculpture in themselves; with intricately cut patterns made on the paper seem to flow out of the talented hands of the cutter. Chinese lanterns are also a standard Chinese craft idea that uses paper for its construction. The lantern frame is usually made of bamboo with a paper overlay to diffuse the light. Chinese lanterns are used as more than a decorative element; they were frequently used for ceremonial reasons. Now, Chinese paper lanterns are used widely in many homes across the world to provide a festive and colourful addition to any gathering. Chinese lanterns and papercuts are excellent projects for anyone that wishes to find Chinese craft ideas. Chinese silk is revered as some of the finest quality fabric available. This luxurious fabric has been used for centuries in Chinese crafts. Chinese crafts incorporated a detailed dyeing process technique called batiks. Chinese batik is a beautiful decorative process for dyeing fabric using was to create a pattern prior to dyeing. Chinese embroidery is a craft that dates back thousands of years. The Chinese were the first to use embroidery as an art form. Chinese embroidery uses a thin sheer layer of silk. The silk fabric is embroidered, sometimes on both sides. In many cases, Chinese embroidery is often embroidered on both sides. Chinese kites also incorporate silk. Chinese kites were made of bamboo for the frame, and silk for the sail and bridle, all items readily available in China. Chinese kites are colourful silks, and some are beautifully painted. Chinese fans also use silk in their making. The beautiful Chinese fans are frequently hand painted and hand died. Many Chinese arts and craft ideas use wood blocks. 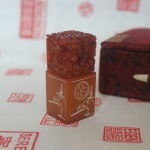 Chinese wood blocks are one of the cornerstones of the printing process. These wood blocks are not only used for paper printing, but printing on silk as well. There are many more examples of the beautiful craftsmanship of the Chinese people. Chinese society prized beauty and tranquility, which is one of the reasons we have some many examples of the Chinese crafts and folk art to enjoy today.